The Z390 Phantom Gaming 9 is ASRock’s ultimate gaming solution, hitting the higher spectrum of pricing at $268.99 US. It’s cost adjusted when compared to the $299.99 US Z390 Taichi Ultimate but the best part is that you don’t lose any feature set of ASRock’s flagship offering with the Z390 Phantom Gaming 9. It’s 12 Phase power delivery is the most stable system and remains consistent in overall stability and overclocking tests. The ASRock Z390 Phantom Gaming series is built for high-tier memory support and DDR4-4200 is just a fraction of what’s possible. I was able to booth up the Trident Z RGB memory kit fine at it’s rated speed of 3600 MHz (CL18) but given that there are higher clocked memory kits out in the market, they won’t be an issue for this motherboard at all. The whole feature set for this motherboard such as Realtek ALC1220 audio codec, a ton of USB 3.1 (Gen 1 / Gen 2) ports, dual M.2 ports and one with an M.2 heatsink is all a user would ever want. In terms of storage, you’d find 8 SATA III ports which are good enough for enthusiasts in addition to the PCIe based storage connectivity. The wireless dongle on the motherboard provides good WiFi coverage over a large distance while the Dragon AIC 2.5G LAN offers great and fast networking experience although the software support could use a more modern update. Aside from that, there are lots of connectivity options such as the expanded storage options which are available on the board. 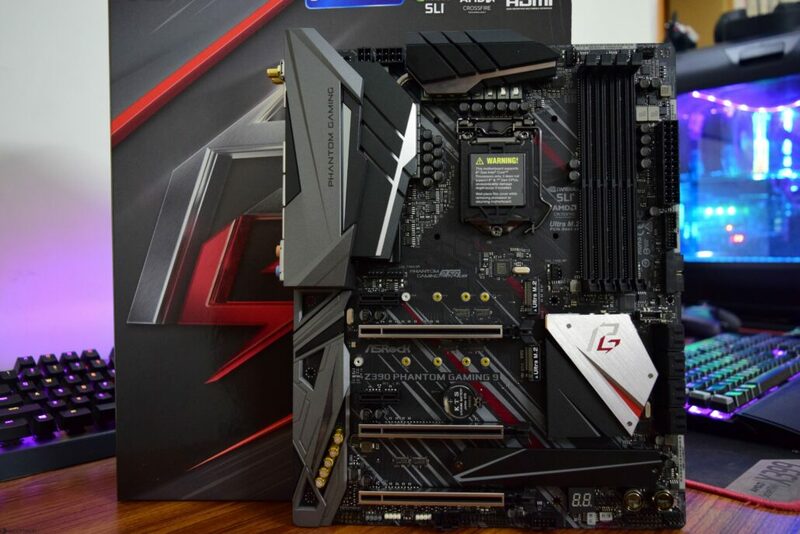 The Phantom Gaming lineup really does put itself aside from ASRock’s standard Taichi and Extreme offerings, delivering best more bang for the buck and retaining the high quality and feature set of the more costly motherboards. If you are going to build a new 8th or 9th Gen Intel-based PC, the ASRock Phantom Gaming 9 delivers you flagship features and performance for a slightly lower price which is impressive. If you are going to build a new 8th or 9th Gen Intel-based PC, the ASRock Phantom Gaming 9 delivers you flagship features and performance for a slightly lower price which is impressive.